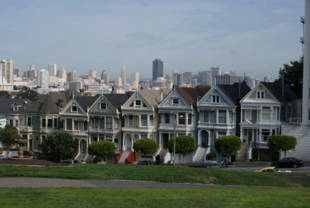 A hilltop park with views of the City (including the famous "Postcard Row"), Alamo Square features many things to do. There is a full tennis court, plenty of walking trails and benches, flower beds, and a dual-level kids' lot that had six swings, three slides and a pair of climbing structures. The upper level is for older kids (age 5-12), while the lower level is for the younger ones (age 2-5). Wheelchair access is available at the gate leading into the upper level. Dogs are permitted in the park, however, they must remain on-leash on the eastern side of the park. They are allowed to run off-leash in the dog play area on the western side. 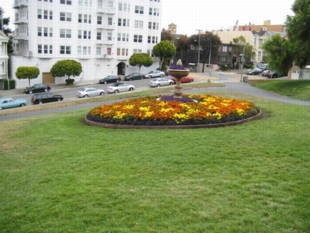 Alamo Square is owned by the San Francisco Recreation and Park Department. 24-Divisdero -- Hayes and Divisidero (one block west of the park). In the ' 50s the beautiful park slid into two decades of deterioration. Homeowners moved away and sold their Victorians to entrepreneurs who divided them into multiple-bedroom rooming houses, many illegal and substandard. Some became halfway houses, drug rehab centers, or boarding houses for hippies. Displaced residents seeking housing flooded in when the Redevelopment Agency demolished large sections of Western Addition. Safety in the park became a serious issue. The Alamo Square Neighborhood Association was founded in the early ' 60s when a group of concerned neighbors banded together to fight the City's plan to slice off the crest of the hill, level it for playing fields and construct a large field house. The protest of outraged residents, the media, and Mayor Joseph Alioto defeated the passage of ill-conceived Measure D. In the early ' 70s, when ASNA's president complained to the police about an epidemic of drugs, burglaries and muggings, the department stepped up patrols, day and night. Over the next decade, conditions improved, and in 1984, thanks to the energetic efforts of a few key ASNA homeowners, Alamo Square's 12 blocks became a Historic District. 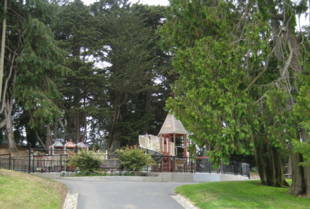 The 1990s were marked by an unsuccessful grant application to the Recreation and Park Department for park beautification and failed requests for maintenance and repair, including the dilapidated playground. A Park Committee of ASNA worked closely with NPC to encourage workdays and to lobby for playground funds. 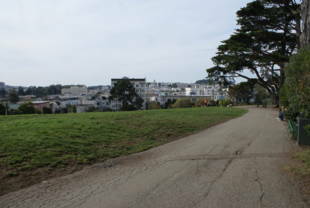 After Props A & C passed in the 2000 election, Rec and Parks' Capital Improvement Plan allocated $1,270,000 to Alamo Square. Sue Valentine, then ASNA president, and parks committee chairman Emmett Gilman listed 14 key issues, secured agreement on them with project director Marvin Yee, and followed up, point by dogged point. The results are in full view throughout the park: the new children's playground, picnic tables, benches and lighting; ADA pathway at Hayes and Steiner, and dispensers for dog waste bags. The new wrought iron fence around the playground required a $36,000 subsidy from ASNA to upgrade the chain link version. Lisa Bastick, who became ASNA's president last year, is continuing the crusade for improvement. The schedule of park workdays now draws 20 to 30 dedicated volunteers; a rose garden has been restored, and new flower plantings are in the works. The restroom's location and abuse problems require more study. 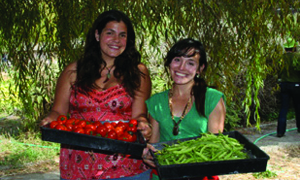 Lisa is working with Supervisor Ross Mirkarimi to find funding to replace the old, broken-down irrigation system that leaves some areas bone dry, and others swampy and flooded. 'Some political wheels are turning,' she says, adding, 'Rec and Park are helpful and responsive and our gardener is terrific.' Like the president herself.